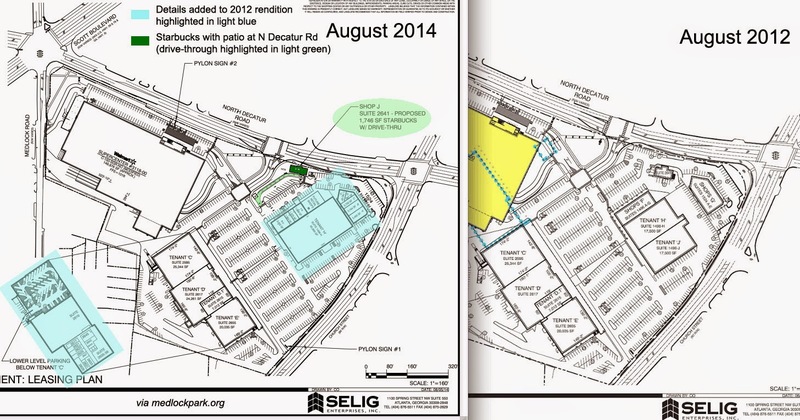 As noted in our June post, Selig Enterprises seeks a special land use permit (SLUP) for a drive-through Starbucks at Suburban Plaza. The plan will be reviewed by the Community Council on August 19, by the Planning Commission on September 9, and by the Board of Commissioners on September 23, 2014. DeKalb County requires SLUPS for all drive-throughs. The proposed drive-through is within the parking lot and requires no additional curb cuts. It appears that the drive-through concept allowed Selig to slightly reconfigure the layout of shops at the corner of North Decatur Rd. and Church St. "Shop J" (the proposed Starbucks) now features sidewalk access from North Decatur Rd. and a patio. 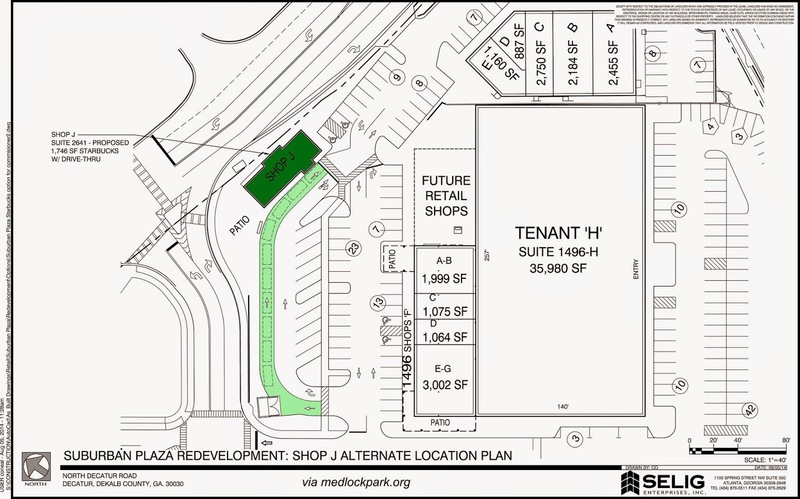 An area area marked "Future Retail Shops" has been added and appears to add an additional ~4,000 SF next to "Tenant H."
August 2014: Proposed location for a street-facing Starbucks and patio. The Starbucks building is highlighted in green, the drive-through (with dashed rectangles denoting vehicles) appears in light green. The 2012 and 2014 schematics are quite similar. In addition to the changes mentioned above, there is some additional information about how retail space might be configured (see blue highlights below). is part of the Walmart building. We do not have any new information about future tenants other than those mentioned last April (LA Fitness with daycare facility, HomeGoods, Jo-Ann Fabric and Craft Stores). Demolition is proceeding as scheduled this summer. 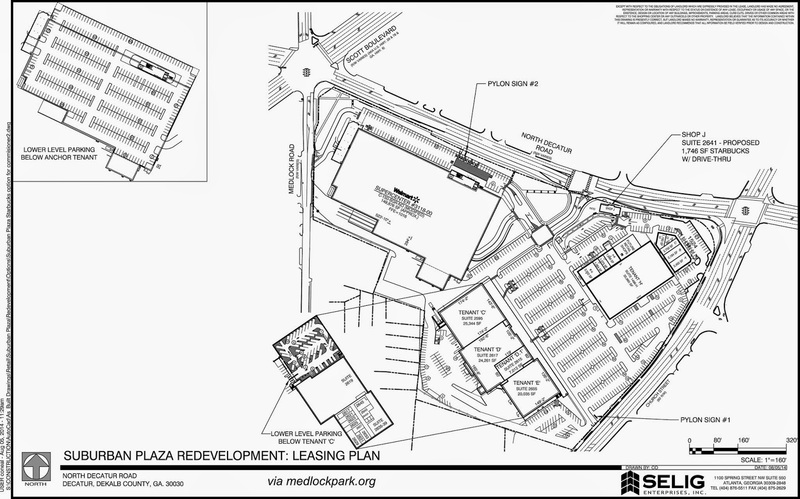 The unenhanced plan for Suburban Plaza, dated August 2014, appears below.